For those who have followed my narrative for a while now, you might recall that WeWork and the overall rise of Coworking office space has been on my radar for the past few years (Click here to read “Rise of Collaborative Workspace” and here to read “WeWork now a $5 billion co-working startup”). The market is always shifting. Building owners are adjusting to what many see as a long-term trend in office space that is here to stay. But is it? Common area amenities such as Tenant Lounges, Conference Rooms, Gyms and Cafés/Food trucks no longer just get you the tour, they are mandatory. The more urban the building the “cooler” the building has to be to compete. 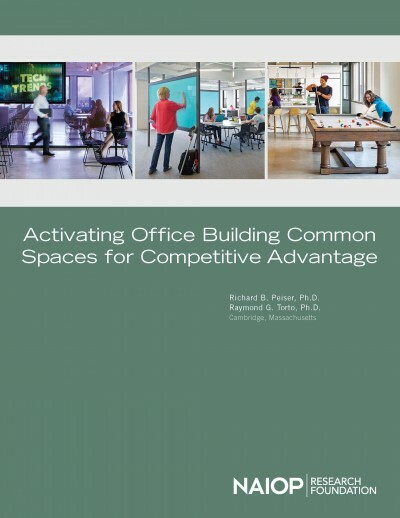 Co-working space in a building is seen as an advantage by less traditional tenants (Start-ups & tech companies). Technology and Flexibility are here to stay — adapt or die. If you want to talk about the Coworking trend and what you or your company is doing, shoot me an e-mail. Despite the rise in work-from-home options, Harris said statistics show that demand for of­fice space continues to grow. The downside to the equation is that a recession could leave coworking companies like WeWork “pretty exposed,” said Harris. Harris said it is important for companies to have slack space in order to hire more people. In response, Foster noted that the NAIOP Research Foundation recently published a paper, “Activating Of­fice Building Common Spaces for Competitive Advantage,” that looked at co-working in of­fice buildings. It showed that owners of of­fices like having a co-working center in their building because it serves as the flex space, so as tenants expand and contract, they can do so in that building. Stapp wondered if what’s happening with WeWork is challenging how the commercial real estate industry deals with built space. He noted that use of space has typically been tied to a speci­fic place, for a speci­fic period of time, with the space commitment sealed by a lease. He suggested that if a landlord owns 20,000 apartment units, his objective is to keep cashflow in his portfolio. The user, on the other hand, wants extreme mobility. Rather than having a lease for a defined space over a defined period of time, why not operate a portfolio that’s available to everybody? Through the use of technology, if a tenant wants to move, he or she can pick a new unit that’s available somewhere in the portfolio. “It’s a total rethinking about how we generate revenue, how we keep people in space, how we use space, and the extreme mobility that it provides,” Stapp said. Harris said WeWork is providing “space as a service” to businesses, a concept seconded by Stapp. By Richard B. Peiser, Ph.D. and Raymond G. Torto, Ph.D.